The death of Crassus (Marcus Licinius Crassus) is a classic Roman object lesson in greed. Crassus was a wealthy Roman businessman of the first century BCE, and one of the three Romans who made up the first Triumvirate, along with Pompey and Julius Caesar. His death was an ignominious failure, he and his son and most of his army slaughtered by the Parthians at the Battle of Carrhae. The cognomen Crassus means roughly "stupid, greedy, and fat" in Latin, and in the aftermath of his death, he was vilified as a stupid, greedy man whose fatal flaw led to public and private disaster. Plutarch describes him as an avaricious man, stating that Crassus and his men died as a result of his single-minded pursuit of wealth in central Asia. His folly not only killed his army but destroyed the triumvirate and demolished any hope of future diplomatic relations between Rome and Parthia. In the mid-first century BCE, Crassus was the proconsul of Syria, and as a result, he had become enormously wealthy. According to several sources, in 53 BCE, Crassus proposed that he act as general to wage a military campaign against the Parthians (modern Turkey). He was sixty years old, and it had been 20 years since he had participated in a battle. There was no very good reason to attack the Parthians who had not attacked the Romans: Crassus was primarily interested in gaining the wealth of Parthia, and his colleagues in the Senate hated the idea. Efforts to stop Crassus included the formal announcement of bad omens by several tribunes, particularly C. Ateius Capito. Ateius went so far as to attempt to have Crassus arrested, but the other tribunes stopped him. 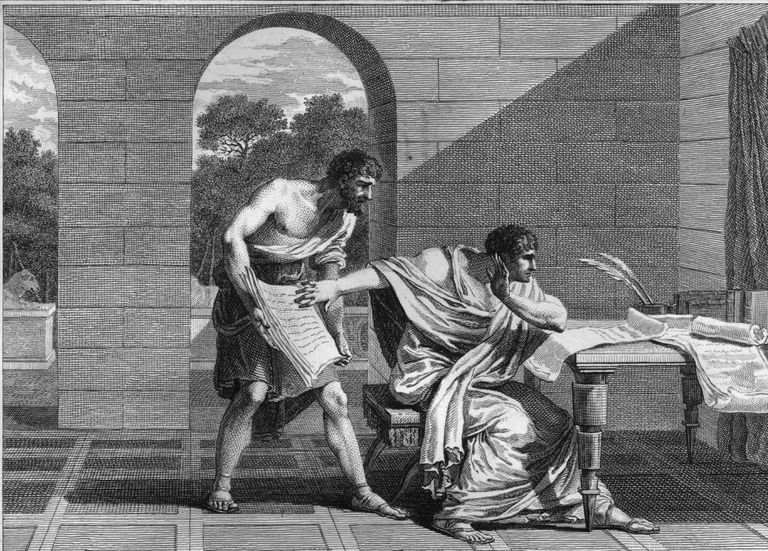 Finally, Ateius stood at the gates of Rome and performed a ritual curse against Crassus. Crassus ignored all these warnings and set out on the campaign which was to end with the loss of his own life, as well as a large part of his army and his son Publius Crassus. As he prepared to go to war against Parthia, Crassus turned down the offer of 40,000 men from the king of Armenia if he would cross the Armenian lands. Instead, Crassus chose to cross the Euphrates and travel overland to Carrhae (Harran in Turkey), on the advice of a treacherous Arab chief called Ariamnes. There he engaged in battle with the numerically inferior Parthians, and his infantry found they were no match for the barrage of arrows fired by the Parthians. Crassus ignored advice to reconsider his tactics, preferring to wait until the Parthians ran out of ammunition. That didn't happen, in part because his enemy used the "Parthian shot" tactic, of turning around in their saddles and firing arrows while riding away from the battle. Crassus' men finally demanded that he negotiate an end to the battle with the Parthians, and he headed off to the meeting with the general Surena. The parley went awry, and Crassus and all of his officers were killed. Crassus died in a scuffle, possibly killed by Pomaxathres. Seven Roman eagles were also lost to the Parthians, a great humiliation to Rome, making this a defeat on the order of Teutoberg and Allia. Although none of the Roman sources could have seen how Crassus died and how his body was treated after death, a rich set of myths are written about that. One myth said the Parthians poured molten gold into his mouth, to show the futility of greed. Others say the general's body remained unburied, cast among the undistinguished heaps of corpses to be torn apart by birds and beasts. Plutarch reported that the winning general, the Parthian Surena, sent Crassus' body to the Parthian King Hyrodes. At a wedding party of Hyrodes' son, Crassus's head was used as a prop in a performance of Euripides' "The Bacchae." Over time, the myth grew and was elaborated, and the upshot of the gory details was the death of any possibility of diplomatic reconciliation with Parthia for the next two centuries. The Triumvirate of Crassus, Caesar, and Pompey was dissolved, and without Crassus, Caesar and Pompey met in battle at the Battle of Pharsalus after crossing the Rubicon. As Plutarch says: "before he went upon his Parthian expedition, [Crassus] found his possessions to amount to seven thousand one hundred talents; most of which, if we may scandal him with a truth, he got by fire and rapine, making his advantages of the public calamities." He died in pursuit of wealth from Asia. Braund, David. "Dionysiac Tragedy in Plutarch, Crassus." The Classical Quarterly 43.2 (1993): 468–74. Print. Simpson, Adelaide D. "The Departure of Crassus for Parthia." Transactions and Proceedings of the American Philological Association 69 (1938): 532–41. Print.